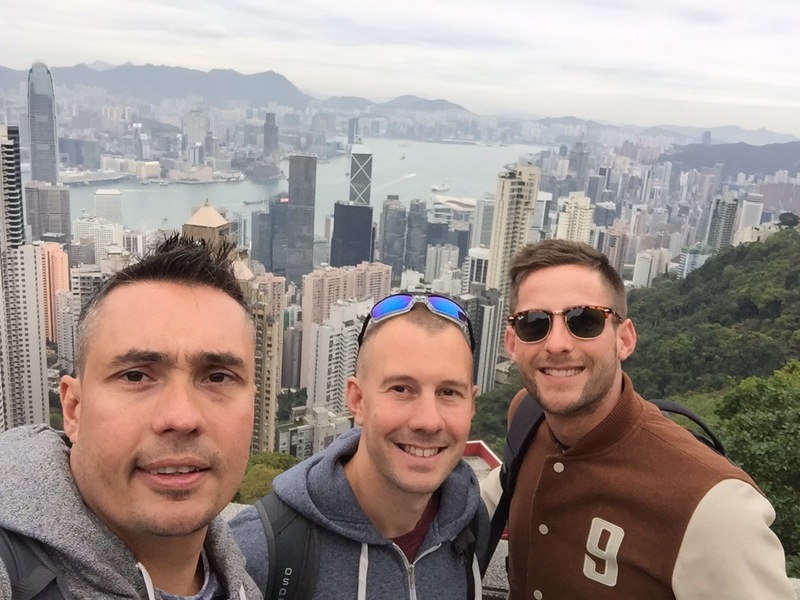 Having explored the Kowloon side of Hong Kong by ourselves, we were ready to explore Hong Kong island with our friend Sam. He arrived late on Saturday afternoon and we changed and headed out straight away. 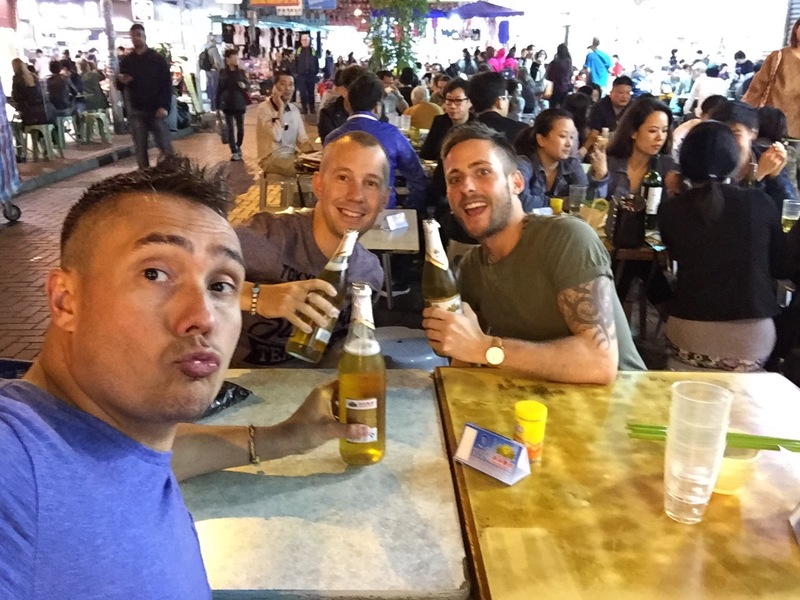 First we took him to the temple street night market. Bustling with fake goods from sun glasses to speakers it made for a good introduction to Hong Kong. We ate local street food, some dumplings, sweet and sour and our favourite broccoli with garlic. After waiting almost an hour for it we demolished it quickly and headed down to the water front. We had hoped to watch the light show but as it was world lights our day it was the one evening they weren’t doing the show. Undeterred we took some selfies with the city behind us and took the local ferry across to Hong Kong island. The ferry offered some more up close views of the skyscrapers as well as some interesting angles. We headed to some local bars and ended up in a club on the 20th something floor of a tower. The elevator doors opened straight into the club and the music was pumping. I wouldn’t want to live above or below! The drinks were over priced but we had fun none the less. The following morning we walked down the shopping street and viewed the city in the daylight. We also took the exact same ferry back across but headed to Victoria Peak (the mountain that sits behind the city. After taking a cheap shuttle bus we arrived at the tram station to the peak. The queue was very long snaking around the corner. After at least an hour of waiting we boarded the tram (a few elbows were needed to secure our ride up!). The tram is one of the steepest ascents in the world, was built in 1888 and took about 10 minutes. Originally just for residents the tram now takes thousands of tourists up the mountain each day to enjoy the views. At the top is a huge shopping centre complete with restaurants and viewing platform. Instead of paying extra to go to the viewing platform we walked around the corner to the free viewing point. The views are spectacular and give you a good understanding of the layout of the city and how Hong Kong is made up of some many islands. Once we had enjoyed the views and taken yet more selfies (Sam is selfie mad), we ate some lunch and descended. Our flight to Australia was in he evening and we took a leisurely tram, bus, ferry and walk back to the hotel to collect our bags. We discovered the A21 bus is the best way to get to the airport and a fraction of the cost of the train tickets, and had comfortable seats and wifi. Excited for some sun and the sights of Australia we boarded the plane for an 8 hour overnight flight. ← What are the top things to see in a day in Hong Kong?